A few years back there was a much ballyhooed drilling effort to find some 175 million year old sea floor touted as the “oldest”. Incorrecto qui mo sabe. That particular ocean floor is interesting in its own right (see our post “Great Mysteries of Nature Nobody Seems to be Thinking About”), but it is spring chicken compared with the oldest ocean floor. 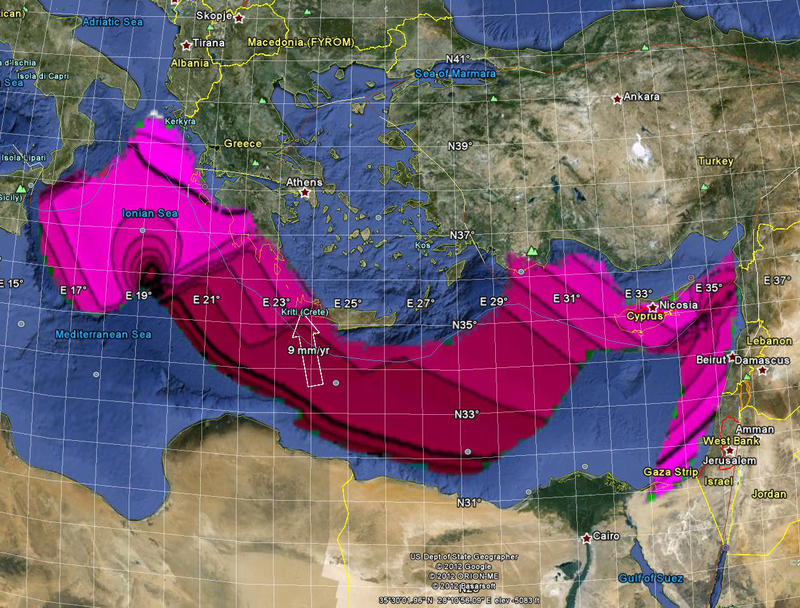 In the Mediterranean Sea the dark isochron near the bottom of the deep purple is 270 million years old and the dark isochron in the lighter purple at the top and to the far right is 240 mya. This remnant spans the great Permian Extinction. Being a hundred million years older than the oldest Pacific Ocean floor is interesting enough, but the shape of the isochrons is astonishing. 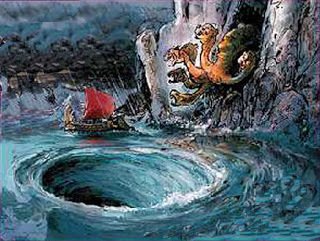 I like to call it Charybdis. Now this feature is not exactly at the Straight of Messina but it is definitely in the Ionian Sea. Amazing stuff, mythology. If you look carefully the 270 mya isochron and the 275 below it do not get sucked into Charybdis but end in a transform system just before it. If you count the isochrons down into Charybdis you get to a complete circular 270 mya isochron. How weird is that? Let’s go to the eastern Mediterranean off the coast of Syria. Here we have a less well-developed Charybdis and tortured transform system that also begins with the 245 mya isochron. This entry was posted in Anthropology, Geography, Geology, Paleogeography, Plate Tectonics and tagged Charybdis, Earth Sciences, Mediterranean Sea, Oldest Ocean Floor, Pacific Ocean, Seabed, Seafloor Isochrons. Bookmark the permalink.